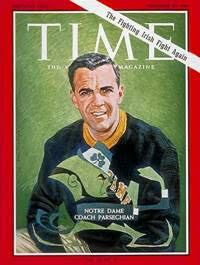 The Notre Dame Leprechaun was designed by sports artist Theodore W. Drake. He worked as a designer at Wilson Sporting Goods in Chicago where he created the logo for the University of Notre Dame in 1964 for $50. Per an article in the 1960 campus news magazine, the Scholastic, a student named Terry Crawford became the first leprechaun to join the cheerleaders on the sidelines. The leprechaun outfit consisted of shoes that turned up at the toes, a bright green jacket, elf-like cap and green cotton pants. Then in 1961, a University of Notre Dame freshman, John Brandt got the job as the leprechaun mascot. He was chosen because he was short in stature, just 4 feet, 11 inches tall, and the uniform fit him best. The leprechaun was not the official mascot in those days. It was a live Irish terrier, Clashmore Mike, that was the official mascot and it was Brandt’s responsibility to lead the terrier dressed in a ND jacket around the Notre Dame Stadium field during breaks in football games. The dog lived with a Notre Dame Stadium groundskeeper and his wife in a house east of the campus. The crowds loved the idea of a leprechaun mascot so Brandt became something of a celebrity. The Leprechaun was named the official mascot of the Fighting Irish in 1965 when the Leprechaun was registered as an official university mark and the terrier was retired. The Fighting Irish logo features a side view (the Leprechaun must always face right) of the Leprechaun with his fists up, ready to battle anyone that comes his way. The Leprechaun represents the tenacious spirit and determination of the Fighting Irish. 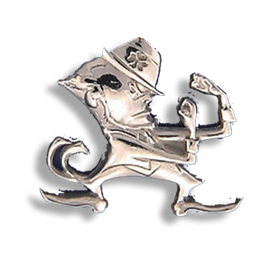 We love the Leprechaun and have made his likeness in charms, cuff links, earrings, lapel pins, pendants, and tie tacks.